” President Donald Trump’s Week 8 in Office – March 13 – 17, 2017 – Trump Crosses the Rubicon ” . This is in brief the actions put into effect by President Donald Trump during his Week 8 in Office, March 13 – 17, 2017. 1. President Donald Trump’s revised Travel Ban Order has been blocked by Federal judges in Hawaii, and Maryland upsetting the administration. It now seems a long and risky battle ahead for the administration. This is the second time the Travel Ban Order has been thwarted, sfter a Seattle Court halted the earlier version of the Executive Order last month. President Donald Trump calls it an “unprecedented judicial overreach”. 2. President Donald Trump’s ‘America First Budget’ for the coming financial year will slash the EPA funds by 31%, and State Department funding ( Arts, Diplomacy, Health Services, Housing etc) by 28%, even while the Military & Border Security allocation is expected to increse by $ 54 billion. 3. $ 1.2 billion cut for after school and summer programs has been resented by academia. It will have a negative impact on learning inputs to nearly 1.5 million students in Community Learning Centers – Educational administrators lament. 4. Congressional Budget Office predicted an increase of 24 million people without health insurance by 2026 under the Republican Plan, while also forecasting $ 337 billion in deficit reduction over the same period. 5. President Donald Trump has called for speeding up growth in manufacturing. Executives in Toledo, Ohio, are specially happy about their prospects under President Donald Trump for his promises on fewer regulations, lower taxes, and healthcare costs. 6. Federal Reserve raised its benchmark interest rate by 25 basis points. Since 2008 financial crisis it has only been the third time that the Fed Reserve raises the rate(s). 7. Republican representative David Nunes, California, said he had not seen any indication that former President Barack Obama wiretapped President Trump’s phones in Trump Tower during the 2016 presidential campaign. 8. President Donald Trump disclosed that he paid $ 38 million in federal income taxes on his reported income of $ 150 million in 2005, an effective rate of 25% according to the White House statement. 9. According to Time magazine, a new president and a protest movement transformed the Democratic Party to be more comfortable as an opposition. 10. Neil M Gorsuch’s confirmation hearing ( for SC judge) will begin on March 20, 2017. 11. Secretary of State, Rex Tillerson, said in a resolute manner that no negotiation with North Korea to freeze its nuclear or missile programs or to buy time for a consummatory future decision, considering implications on all fronts. “Third time Lucky” – we have heard this old pithy saying any number of times on any number of occasions before. President Donald Trump’s travel ban order has been challenged first by a Seattle Court, and now by judges in Hawaii & Maryland. 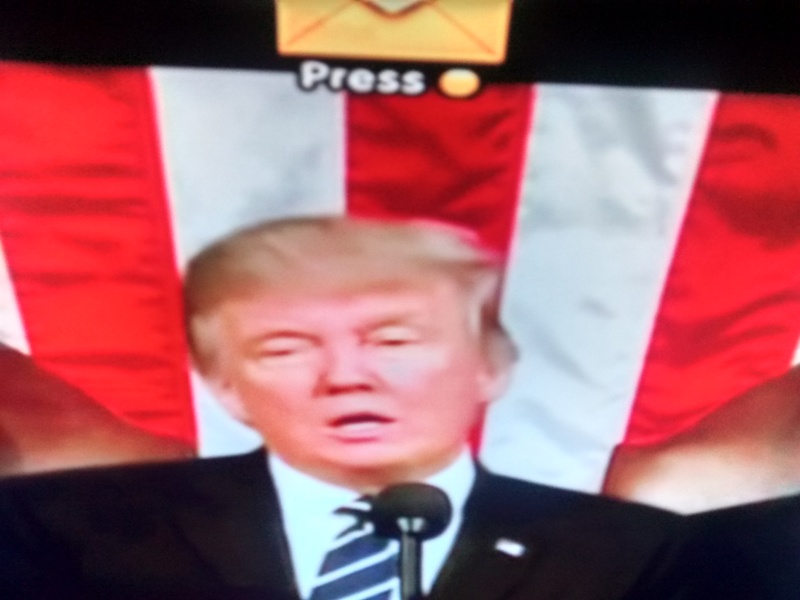 If President Donald Trump in any little measure tweaks, not with procedures and acts of tests, but with just the swords of words powerful as they can be in his fight against the neoteric political shehnanigans of this new millennium, he can very well transform the adversarial (lost) ground on this issue into a friendly (earned) ground that will be etched in the history of his Presidency – like abolition of slavery ( this is abolition of terrorists intrusion) in the case of the great, great, Abraham Lincoln. If you erect a fence around your house; if you prefer to live in a gated community with safety ensured; if you establish a new community in an isolated area ( say, in the outskirts of the city) free from the ills and evils of a congested, corrupt, and polluted society; – each with limited ownership and the ensuing right of free living, your act will be regarded an ‘innovation’ with good intention. The travel ban is all similar to the above marked only by differences in scale and national boundaries, and the force of stringency in adopting a solution to a problem. What is at the root of this issue is what we generally ascribe to in management parlance as the sheer “resistance to change”. If new technologies, despite their associated evils, make life and work more easier, quicker, and efficient; the same arguments can hold true in this case also, centered around ‘safety and security of people’. This aspect needs better clarity, though. 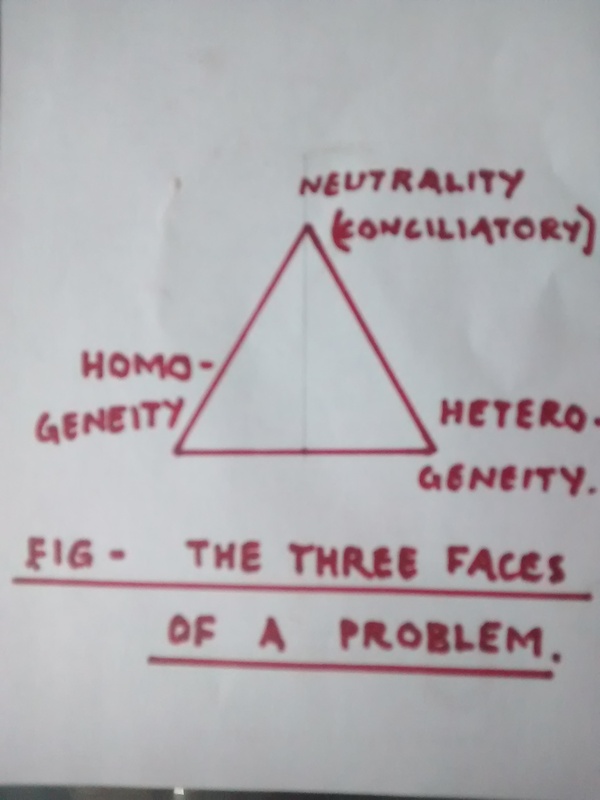 The figure below depicts the three faces of this problem succinctly in terms of a choice between homogeneity, heterogeneity, and neutrality. Put simply ( no details here) it is neither ‘homogeneity’ (perfect harmony, no groupism); nor ‘heterogeneity’ ( religious distinction and attitude differences of people); but “neutrality” ( striking an attitude of conciliation with no groupism) that will help solve this issue. This is also the means by which a leader can score and secure his position as ‘unique, distinct, and special’. It will be apt to narrate briefly an incident from a movie in a vernacular Indian language here. It is about a honest, shrewd, and daring Police Officer confronted with a politically powerful leader who breaks into his police station with his ruffian goons ( much like the myrmidons of law?) to get his jailed right-hand man released invoking the ‘religious’ card of caste as the basis of his capture while at the sametime taking pride in his ability to make it a serious ‘religious’ affront to the detriment of the entire state in physical terms within a day. The honest and astute Police Officer calls his constable belonging to the same caste (religion) as the jailed thug to thrash him in front of the leader, who just a while ago threatened him with dire consequences to the state. The honest Police Officer also uttered these words : ” If only a man of a different religion hits the jailed thug, it becomes a case for differentiating on the basis of religion; but now the jailed thug is hit by a man belonging to his own religion. Do you have anything to add now? ” The political leader was given just 10 seconds to react or leave; and the political leader left without uttering a word, foaming at the mouth though. Lesson : Specialisation(s) and generalisation(s) are different aspects in the nature of any problem/issue. They ought to be viewed and assessed with a different lens. Herein lies the solution to the President’s problem too : If only a host of Muslim Organisations/sect leaders across the nation can come in support of this move, in the larger interests of the safety of people and the country (without digging their heels in), the ambagious course that many analysts, press, media, and people anticipate in this case can be avoided. P.S. I am no supporter of any one leader in partcular, residing in a country and place with no stakes whatsoever on this issue at this juncture. My attempt here is just in the nature of presenting a contrarian, commonsense management perspective for further discussions. Tidbit : ” No Strategic Patience ” – Secretary of State, Rex Tillerson, to North Korea.